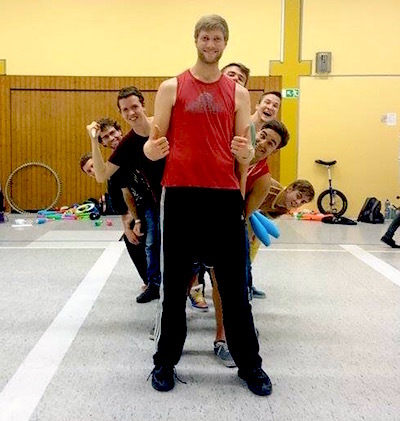 Another weekend, another juggling convention in Germany, another combat tournament. This time in Bad Ems. 16 jugglers took part in the qualifications, including six jugglers in the top 30 of the FNC rankings. The top ranked player, Dominik Harant, made an early exit after he was beaten in the round of 8 by one of his world-record-breaking juggling partners, Manuel Mitasch. Manuel then lost to eventual winner Andreas Braun in the semi-final... and then lost to Jan Poolen in the third place match. Andreas's wins at Bad Ems and Eindhoven this year put him into strong contention for one of the 10 places at the European Masters 2015 in December in Berlin. Julius's two second place finishes lifts him to 11th in the Race Rankings, and 9th place on the provisional invite list. You can follow along with who is in the running for the end-of-year final tournament on the European Masters 2015 Qualification Overview page. Next weekend there will be two more Fight Night Combat tournaments! Camvention 2015 hosts the third Cambridge Fight Night, this year a 300 point tournament featuring current top 5 player Jon Peat. In Poland: Gdynia 2015, featuring EJC 2015 quarter-finalist Jakub Szwed.